Steampunk is a subgenre of science fiction or science fiction inspired by 19th-century industrial steam-powered machinery. With this command you will become a cyborg. This mechanism adds new gadgets. Accelerators, lasers, grenades and more. Some new features of Minecraft 1.13 have been tested here. And in general, she is created for fun. 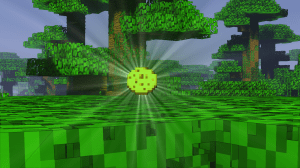 Spawn giant lucky blocks into your world! With giant lucky blocks, the rewards are greater- but so are the consequences. Have you ever wanted to destroy stuff with waves? I think you came to the right place! I don't think you're ready for this! Will you survive the food apocalypse? What if you could push blocks in Minecraft? Every time you jump it raises! Can you survive? Can you beat Minecraft without moving at all?